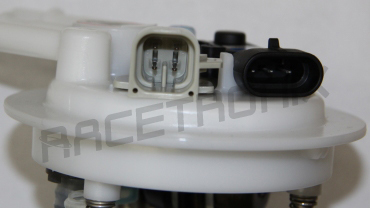 * Please view the pictures on the right which show the module's connector and the mating harness connectors for compatibility on select GM SUVs. Why use a Racetronix Fuel Pump Upgrade Harness? High performance fuel pumps need a good power source in order to perform to their full potential. On average a Walbro high-performance fuel pump requires twice as much power as a factory fuel pump. Factory wiring is just enough for a factory pumps power requirements because manufacturers need to save cost and weight. Racetronix field tests have shown that running a high-performance fuel pump off of the factory wiring can cut pump performance by 30% or more. Problems with failing factory relays, connectors/terminals and fuse contacts are also common when excessive load is placed on them. The Racetronix plug and play harness is designed to remove all fuel pump load from the factory pump circuits while providing the pump with a new heavy-duty power source. The Racetronix harness gets its power directly from the alternator's battery terminal. The voltage at the alternators output is typically 1-2 volts higher than at the battery when the motor is running (high charge/load conditions and WOT). This means that your Walbro high-performance pump can provide as much as 20% more fuel in some cases. The Racetronix harness uses high-quality automotive-grade wire which is resistant to oil, gas, heat and rot. The main length of wire in the Racetronix harness is ten-gauge stranded copper. This is three to four gauges thicker than factory wire which helps reduce resistive power loss to almost non-existent levels. This helps improve pump performance by as much as another 10-20%.High-quality weatherproof fuse holders and relays are used for maximum reliability. The Racetronix harness has factory-type connectors which plug directly into your fuel pump module/sender so no cutting or splicing is required. The Racetronix harness has a redundant ground upgrade as it is necessary to improve the harness on the negative side of the pump's supply as well. There is nothing worse than being in the middle of an installation only to find that the manufacturer has skimped on installation hardware. This is why Racetronix supplies a spare ATM fuse, 25 black nylon wire ties, silicon grease and stainless mounting hardware with each kit. Racetronix harnesses are considered the best by which all others are judged. Attention to detail in every Racetronix harness is evident at first glance. Racetronix spares no expense to ensure reliability, ease of installation and performance. All Racetronix harnesses are assembled using our computerized crimp-quality monitoring system and then circuit checked for the utmost in reliability. As with most Racetronix harnesses the FPWH-001 is backed by our limited lifetime warranty. An optional battery to body ground upgrade kit is available (P/N BGK8). This kit upgrades the under-rated factory ground wire running from the battery to the chassis. It includes an 8 gauge copper wire fitted with terminals and battery nuts with accessory taps. We highly recommend this inexpensive option because this is a weak point in these cars. The Racetronix harness comes equipped with an interface connector just after the relay (see product picture above). This connector in combination with an optionally supplied connector set (P/N PBIC) allows for easy plug and play addition of a pump booster / voltage amplifier such as the MSD or KB units. These voltage amplifiers / boosters will allow the Racetronix single in-tank pump system to support an additional 100-200 flywheel HP (B.S.F.C. dependant) when run at 16-17 volts. This configuration offloads the excessive current draw placed on the factory wiring onto the heavy gauge Racetronix harness system. System diagnosis becomes easier by simply being able to unplug, isolate and bypass sections of the wiring system.